Yesterday I attended the Detecting Shropshire dig as a guest. It was held at a site in north Shropshire and we all met at a pre-arranged spot before driving in convoy to the day’s farm. The weather was shockingly windy; as we drove up the farm track past a dead tree, a large branch was torn off and landed only a few feet from the passing cars. Once we were parked up and out of the shelter of the farmyard it was obvious a gale was whipping across the fields. In fact it was so strong that when I put the Deus down to dig a hole the wind started to blow the detector away, bowling it along the ground. (Yes, folks, that’s how light the Deus is – it blows away in a gale.) The fields were also covered with rotted manure, which meant that you had to pick carefully which areas to detect and dig and which to avoid. By around noon people were gathering again in the farmyard, not only for lunch but to get out of the wind for a while. A handful of people left at this point, though who knows whether they would have done so if the weather had been better. Having scoffed lunch and downed a couple of cups of coffee I tried to persuade myself that I was ready to tackle the gale again. And failed. Coward that I am, I decided to call it a day too. This was, despite everything, the best day’s digging I’ve had in ages. I found nothing spectacular but I’m still learning how the Deus works and I came away with a handful of small finds, including my first thimble, though others did very well and found more than I did, both in terms of quantity and interest. 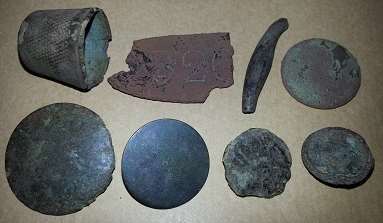 Finds: 1 thimble, 1 ear tag, 1 Georgian grot, 4 buttons and 1 piece of drawer handle.